short girl, long island. : Teach Me Something Thursday, Volume Fourteen. Welcome to Teach Me Something Thursday. 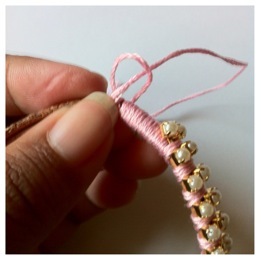 This week, Cindi, owner of Bracelets by Cindi, teaches us how to make a double stranded pearl rhinestone chain bracelet. If you prefer to give handmade goods during holiday season, this would be great addition to a goodie bag filled with cookies + homemade chocolates! 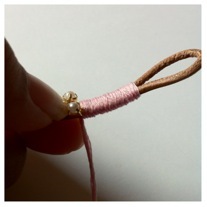 Fold leather cording in half so that you form a loop. 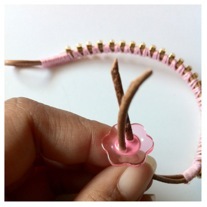 Make sure that the loop fits around the button, which will serve as a clasp. Run the tip of the embroidery floss up the length of your leather cording towards the loop, and wrap your embroidery floss around the cording 5-10 times working your way down the leather cord. 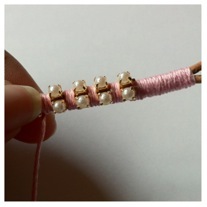 Place both strands of the pearl rhinestone chain along the leather cording and begin wrapping your embroidery floss around the pearl chain 3 times (between each pearl rhinestone) down the length of the cord. Continue wrapping, meanwhile checking for fit around your wrist. 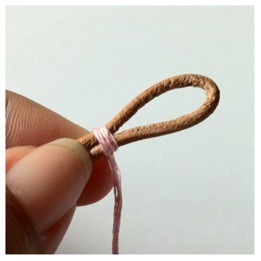 When you reach the end, wrap the embroidery floss around your leather cording 5-10 times, like you did in the beginning, and secure with a double knot. Add a dab of glue. 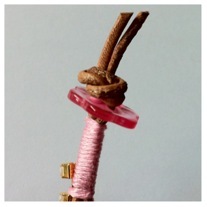 To finish, thread button onto both pieces of cord and tie an overhand knot with the leather cord ends. Snip off extra cord. Have fun with this project and be creative - you can substitute the pearl chain with rhinestone chain or ball chain to create a whole new look! Also, you could turn this into a double or triple wrap bracelet by doubling or tripling the measurement of the materials. Happy crafting! 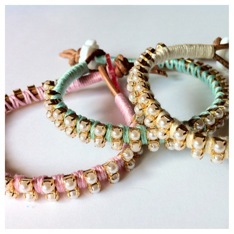 Make sure to stop by Bracelets by Cindi + Hello Cindi, to see her latest creations.